Since GINZA SIX opened, I’ve returned several times to the Beauty Floor, the first basement floor. It features wide hallways like a shopping center overseas. The stores have an open feel, and there’s an easy welcoming air that encourages visitors to step in. The brands, too, run from hip makeup to high-end skincare, niche luxury, and ethical natural cosmetics. There’s ample variety, which makes it easy to try out this and that. On this particular trip, I came to check out beauty oils, which have regained their popularity. 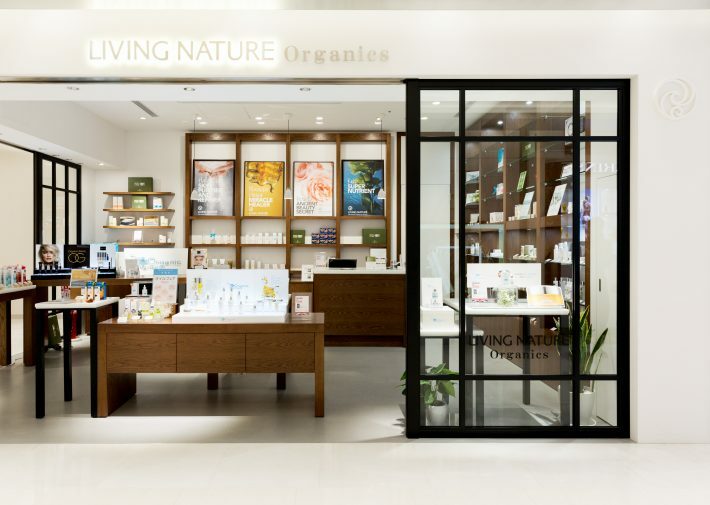 LIVING NATURE Organics carries Patyka and various other natural cosmetics, including the brand—The Organic Pharmacy, produced by London pharmacist Margo Marrone—I came specifically to find. The Virgin Cold Pressed RH Oil you see here (30 ml 6,900 yen, not including tax; all prices given are before tax) is made from 99.95% organic ingredients, primarily a rose hip extract produced in Chile and extracted by cold press to prevent damage to its beauty-enhancing components. Also containing vitamin E, sunflower oil, frankincense, and neroli, this beauty oil drew rave reviews when it was introduced in 2016, even from hardened beauty professionals like me. Even now, word-of-mouth continues to spread among people who prefer natural products. As you can see, the Organic Pharmacy’s RH Oil is a dense reddish-orange color. Rich in vitamin C, rose hip is a powerful antioxidant and loaded with nutrients. There’s nothing like oil for penetrating the skin and giving it a luxuriant feel from the inside out. The oil is drawn inward through the skin’s sebaceous glands. That means just a small amount generates a booster effect that improves the absorption of any toner or lotions you use later on. If you apply a more generous amount as the last stage of care, it functions, like a facial mask, as a moisture shield. For days when your skin is especially sensitive, you can pare back your skincare regimen to just oil, which easily blends with your sebum, until the skin regains its barrier functions. A single bottle of oil gives you a broad range of care options and effects. It’s the reason for the current popularity of beauty oil. This entire wall is adorned in these beautiful colors, yellow, orange, red, and amber. 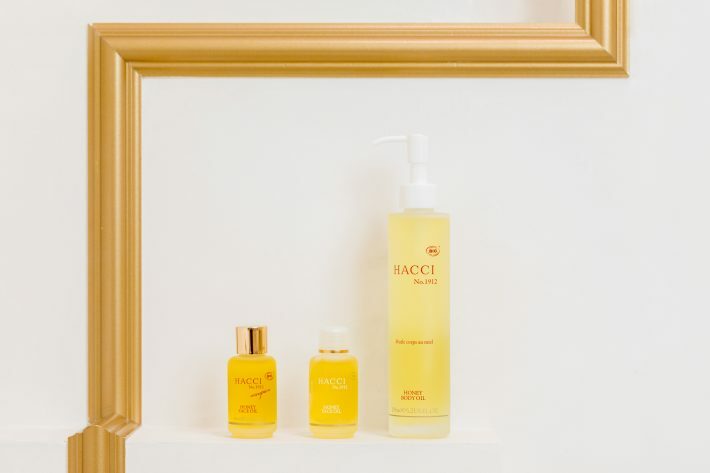 It’s actually all honey produced by HACCI, whose cosmetics and inner beauty items are based primarily on high-quality honey from long-established honey farms. The honey wall is a signature feature of the GINZA SIX store. HACCI carries a good number of beauty oils. The Honey Face Oil escapion on the left (30 ml, 11,000 yen) presents a lovely rose and geranium fragrance that relaxes not only the skin but also the mind and spirit. A base of sunflower seed oil, naturally rich in vitamin E, rose extract, and HACCI’s original finest quality honey delivers the blessings of nature’s gifts directly to your skin. Here in the middle is Honey Face Oil (30 ml 11,000 yen), which has a pleasantly fresh aroma. All the oils were developed in collaboration with one of France’s leading bio researchers. Oils with 100% plant materials have outstanding penetration; they seep easily into and replenish skin. On the right is Body Oil (155 ml 13,000 yen). Good penetrating oil is beneficial to your body’s slackness and cellulite. In addition to enveloping you in a lovely fragrance, the oil moisturizes and firms. It’s a lovely sensation. As I listen to the explanation given by the HACCI sales clerk, I breathe in the aromatic air from the oil she has applied on my hand. I don’t personally like synthetic rose fragrances, but this aroma is from natural Damask roses, a really wonderful scent. I’m told many customers purchase the product because they’re so enchanted with the healing effect of the aroma, and I understand it. 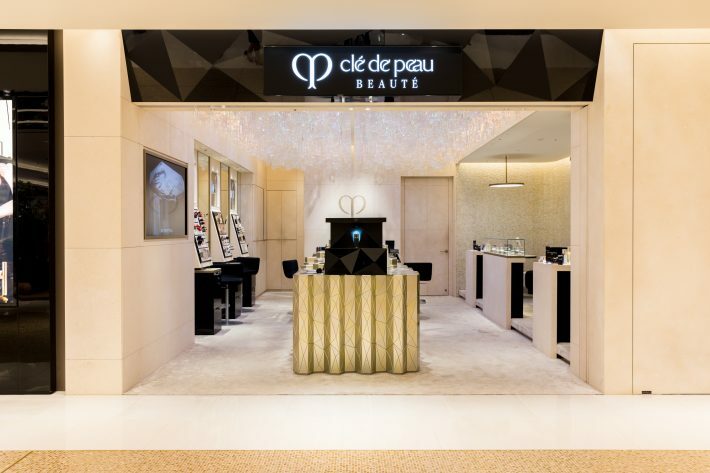 Next, I visit clé de peau BEAUTÉ, one of Japan’s world-famous luxury lines. The GINZA SIX boutique was designed in collaboration with Paris-based architect Tsuyoshi Tane. It’s a luxurious space that expresses the brand’s “Brilliant Cell” concept. Here, you find three semiprivate counseling spaces for unhurried skincare consultations. The evolution of skin analyzers is truly amazing. This one instantly analyzes moisture, transparency, firmness, and melanin levels. It’s eye-opening to experience a method that analyzes current skin conditions this accurately without depending only on feel. 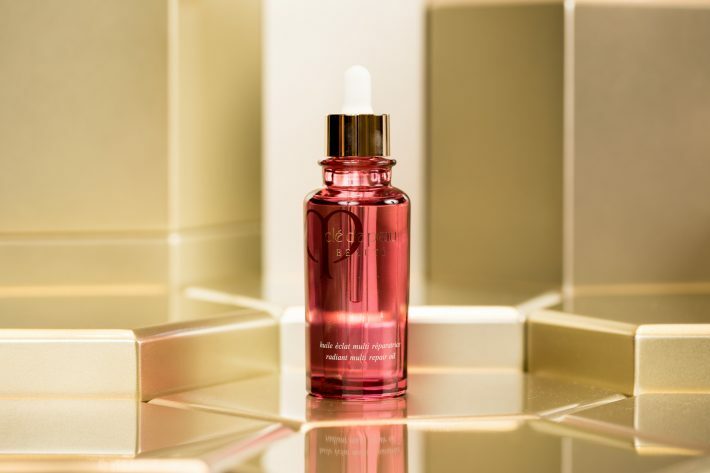 This glamorous pink bottle is the clé de peau BEAUTÉ oil, Huile éclat multi réparatrice (75 ml 14,000 yen). This oil is micronized, so it has a non-sticky texture and instantly flows into the skin. 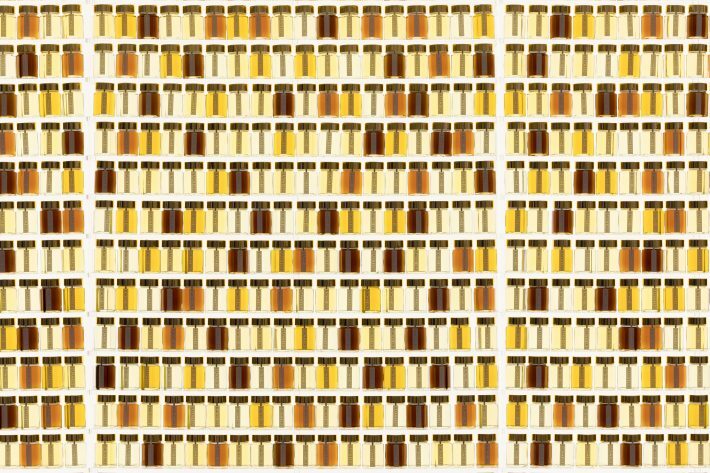 It’s expensive—but clé de peau BEAUTÉ is pretty much the pinnacle, and the volumes are generous, so some may feel it’s actually a bargain. Because it enhances skin function, simple oil-based care provides greater synergies when it’s added to a standard skincare regime. It’s a renowned product that gives a tangible feel for the effects of a beauty oil. So, which oil piques your personal interest? If it’s a product you’re already familiar with, buying online is a perfectly reasonable option. 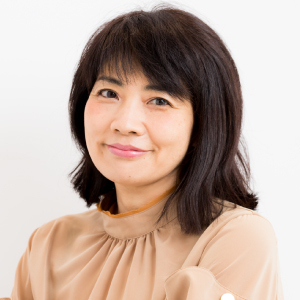 But as a place adults can visit to actually see a product, smell the fragrance, feel it on one’s skin, and refine one’s ability to choose what is right for one’s self, GINZA SIX, with its spacious consultation areas, as I’ve touched on here, feels just perfect. I’ll be back once again when I feel beauty’s spell beginning to wane.